Realm Royale is Hi-Rez Studios’ latest addition to the admittedly crowded battle royale genre. Determined to help it stand out among its predecessors (and the many battle royale games on the horizon), Hi-Rez’s Realm Royale features fantasy-inspired player classes. The general concept and gameplay is similar enough to other games in the genre: Once the match begins, you’ll be launched from a zeppelin and hurtle down to the ground where, upon landing, you’ll begin your hunt for loot and kills. Search chests for weapons, armor, skills and potions and fight solo or alongside squad members to be victorious. Upon joining a match, players can choose to be an Assassin, Engineer, Hunter, Mage and Warrior. Unlike some popular team-based shooters, you can’t change your class once the match begins. It’s important to pick the class you think you’ll like the most and get right to looting and fighting! If you’re just getting started, we recommend checking out our Beginner’s Guide in addition to learning from the advice shared below. Here’s our favorite tips and advanced strategies to help you improve—and, hopefully, win—in Realm Royale. When it comes to your skydive from the zeppelin at the start of the game, Realm Royale does not offer the same conveniences as other Battle Royale games such as Fortnite. There’s no gliders or parachutes, so you’ll want to promptly decide on a destination and fall towards it. You should be able to land wherever you decide with little issue, but it’s important to consider what you’ll be dealing with upon landing. In general, you’ll want to gravitate towards areas with buildings, as they’ll contain chests you can immediately loot for needed weapons and armor. That is, unless someone beats you to them! Already decided where you want to land and just want to get down there as soon as possible so you can make with the looting? Easy. Simply hold down the [W] key (or if you’ve rebound “Move Forward,” whichever key that is) once you’re above your desired destination and you’ll begin hurtling down to the ground as fast as possible. You might as well be naked when you land, because the game starts you out only with your knife. It’s up to you to find and equip shiny new weapons, armor and skills. To do this, immediately begin hunting for basic chests and weapon chests. Potion chests are handy, too, but your first focus should be on securing items to help you in your undoubtable, upcoming battles. If you're lucky, you may even get your hands on a Gold Chest, which can drop Legendary quality weapons! These chests are randomly dropped from the Zeppelin and are displayed on the minimap, so expect to fight for them! Obviously, armor is good and you’re going to need it. Armor provides you with what is essentially a secondary health bar. A full set of Legendary quality armor will provide you with a total of 1200 armor. Epic and Legendary quality armors will also provide passive bonuses. Chest armor grants HP recovery per second, head armor grants cooldown reduction, footwear provides mount speed increase, and gloves provide weapon swap speed as well as an increase to reload speed. Try to collect the best armor you can and remember to craft Legendary quality armor at the Forge. Pay attention to the fog! 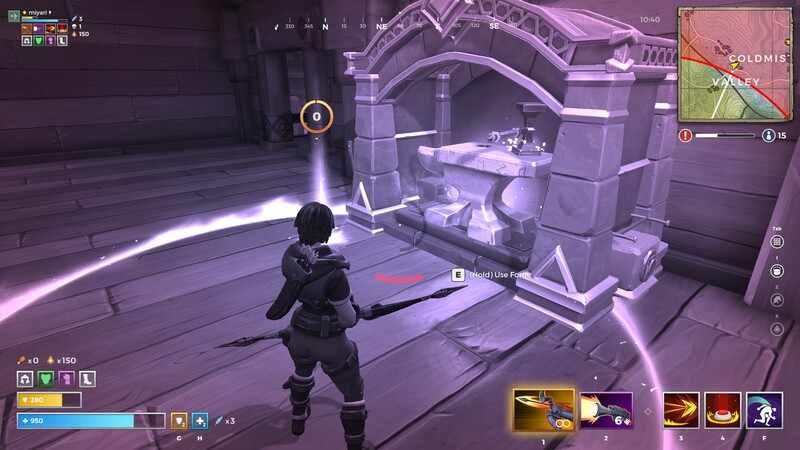 Realm Royale features a fog mechanic that is similar to Fortnite’s Storm Eye. A giant wall of fog surrounds a safe, inner circle on the map, which gradually shifts and shrinks to force players together and keep them engaged. These boundaries are clearly marked on the minimap, and the fog is visible in red. It’s important to pay attention to the current location of the fog, and keep an ear out for the fog horn notifying of its impending movement. This shouldn’t be too hard to do—the fog horn is loud and is accompanied by warning dialog. Realm Royale gives you a horse (and likely a variety of magical beasts in the future) to help traverse its sprawling map, which you can summon with [Z]. You can’t fire your weapons while mounted, but you can reload, so it’s important to only summon your mount when your surroundings appear relatively safe. It’s hard to hide when you’re atop such a noble steed, so be sure to use your mount wisely to get around, especially early on while scavenging for loot or when trying to make your way to the inner circle to avoid the deadly fog. When you down an enemy, they’ll turn into a defenseless chicken. Be sure to also defeat the chicken, as you won’t get kill credit if you don’t, nor will the enemy drop his loot. Upon killing their chicken, you can obtain items that were carried by the player including Shards (used for crafting), weapons and skills, and will also obtain a valuable Chicken Trophy, used for forging your class’ Legendary weapon. 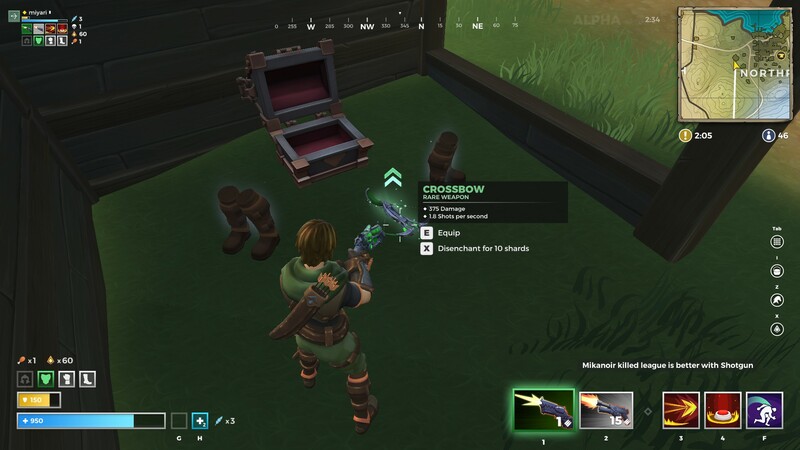 Realm Royale features a unique crafting system that requires the use of Shards at in-game locations called Forges. The primary means of collecting Shards is by Disenchanting unwanted drops. You can easily do so by hovering over a weapon and pressing [X], which will immediately convert the item to Shards that you’ll automatically collect. It’s important to note that you can hold only 200 Shards at at time, so if you’re close to your cap you’ll want to hit up a Forge before Disenchanting any new drops. Make a habit of trying to Disenchant whenever possible; this will prevent enemy players from obtaining drops that may be upgrades for them. Share the good stuff with your squadmates! If you’ve found a weapon or armor upgrade, you can drop your currently equipped item to avoid automatically Disenchanting it upon equipping your new find. To drop an item, hit that item’s key (,  for weapons, , , [F] for abilities or [G], [H] for armor and health potions) and right-click. Doing so can allow a squadmate to loot the piece of armor or weapon you’re replacing, which may potentially be an upgrade for them. You can also drop health and armor potions to help your squad out. Potions are automatically collected from potion chests and are bound to [G] (for Armor Potions) and [H] (for Health Potions) by default. Don’t forget you have them! They’re incredibly crucial in combat situations for all of the obvious reasons, and can even be used to combat the effects of the fog—though that’s pretty unsustainable, so don’t count on surviving too long. You can craft additional potions at the Forge. Seriously! Unlike Fortnite, Realm Royale offers a relatively low jump height. Sorry, bunny hoppers. You can increase the height of a jump by standing close to map geometry (same as it works in Paladins, for fans of Hi-Rez’s team-based shooter). If you’re trying to get up onto some boxes or scale a ledge, get as close to it as possible before hitting your jump to get the most height and hopefully reach your destination. There’s no fall damage in Realm Royale, so feel free to climb as high as you can—just remember that’s probably not the best way to avoid being noticed. While not really a gameplay tip, it’s still very helpful to check your current framerate and ping to the Realm Royale servers. That way, you’ll have information to back up your claims when you blame a death (or missed chicken) on lag. Simply hit the [F9] key to toggle your FPS and ping. This can also be helpful to determine if your gameplay is suffering due to poor routing or insufficient hardware.